Last Summer, the U.S. Army sent three armed robots to Iraq, where they were handed over to the 3rd Brigade of the 3rd Infantry Division. No reports on how those three Swords (Special Weapons Observation Reconnaissance Detecting System) droids have done. But the commander of the 3rd Brigade has asked for twenty more. The army already has 80 more on order. But it's the land based robots that scare us the most. The Swords droid can be pretty scary, especially at night. 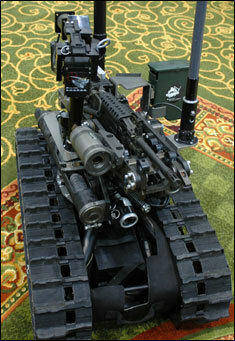 The device looks like a miniature tank, with an M-16 and a little camera mast mounted on it. In an unfriendly, and unlit, Baghdad neighborhood, anyone seeing a Swords moving slowly down the street, making those electrical motor noises, and pointing the M-16 here and there, is inclined to get a little nervous. But that's the point. Troops want to send Swords down those streets, to force the enemy to fire and give away their position. Swords don't bleed, troops do. An unarmed robot is less scary to the enemy, which is inclined to let such a harmless critter poke around. But Swords will not only find you, it can kill you, especially if you happen to be holding an AK-47. Worse yet, Swords can call out in Arabic and demand that you surrender. Most Iraqis are pretty superstitious, and in awe of American technology. Swords is a nightmare come true. But the Iraqi terrorists are also pretty clever. They will soon learn how best to deal with Swords. But in the meantime, the 3rd Brigade would like twenty more, quickly, before the Iraqis catch on. And that's probably why there have been no public reports about what the troops have done with Swords. As Douglas Adams said about the Kil-O-Zap blaster's design specs: "Make it ugly," the Kil-O-Zap's creators told the design team. "Make it clear to people that there is a right side of this gun, and a wrong side, and if they are on the wrong side, things are going badly for them." More: Scientists busy on RoboBugs.